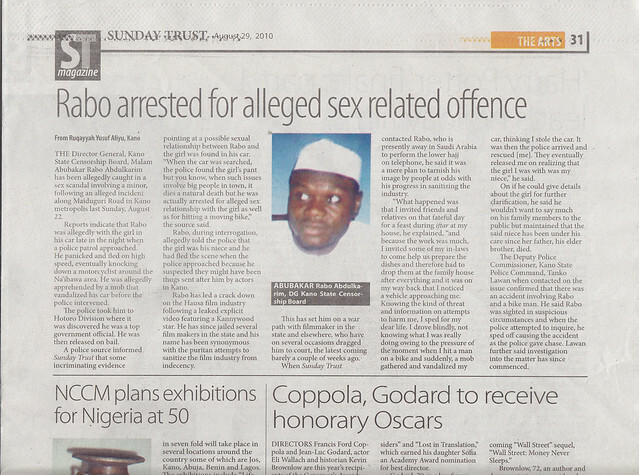 Two days ago (my internet has been down for a day and a half–thus the delay in posting this), I read in the Sunday Trust and the Hausa language weekly Aminiya a story I had heard from filmmakers a week and a half ago before my trip to Abuja. 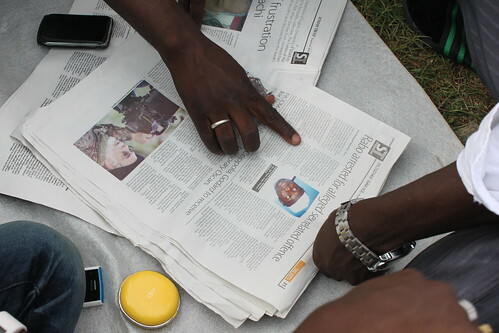 I hadn’t blogged about it because I had only heard ji-ta-ji-ta (rumours) about it, but the newspapers confirm the story. 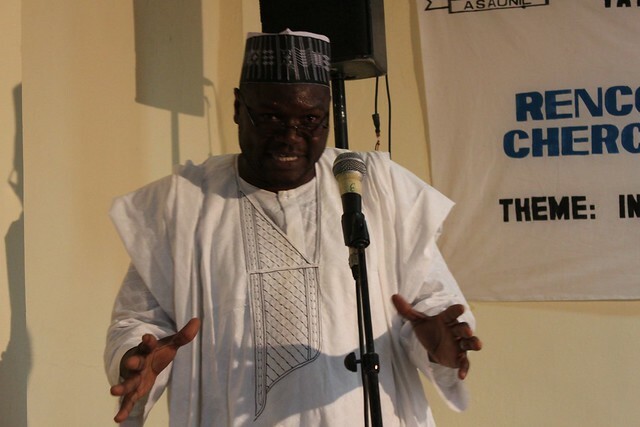 [S]ecretary of the Kano film sellers association, Malam Isa, described shutting down the shops by the censorship board as unfortunate as the director general of the board did not keep to the promise of briefing them on what stand it is taking on the sales of the film before acting. “I can recall that the DG sometimes in October last year invited us for a meeting at A Dai Daita Sahu and during the meeting, one Islamic scholar, Malam Aminu Daurawa, mentioned that watching the film was not appropriate and after the meeting, we met the DG at his office on the matter and he told us that was just a dialogue among scholars which does not involve us. He then promised that he was going to inform us on any development thereafter but unfortunately he didn’t. The next thing we saw was the closure of the shops” he said. 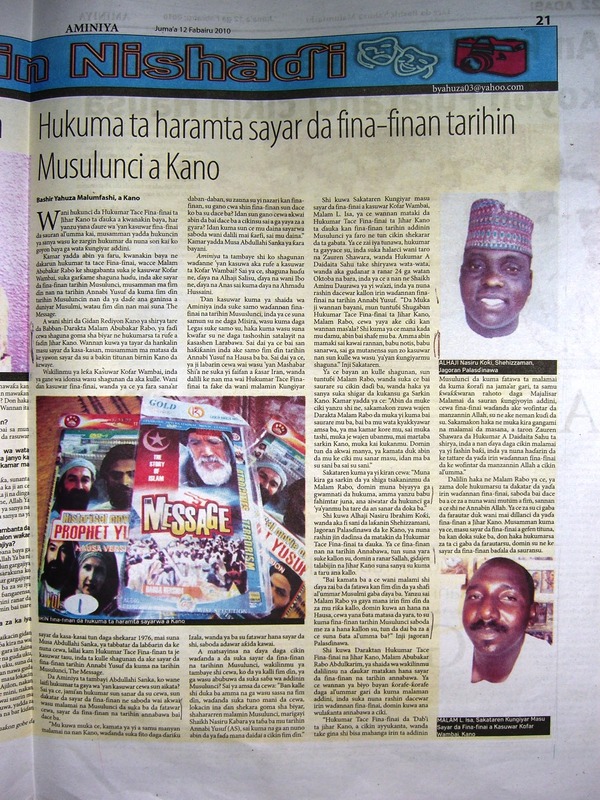 The Hausa weekly Aminiya, 12 February 2010, provides more details. I will provide a summary of the article in English here—please note that this is NOT a direct translation but a summary in my own words. Bashir Yahuza Malumfashi writes in “Hukuma ta haramta sayar da fina-finan tarihin Musulunci a Kano” (p. 21) (“The [Censor’s ]Board bans selling films on the history of Islam in Kano”) that the director of the censors Board Malam Abubakar Rabo went to the Kofar Wambai market and closed four shops where they were selling films on the history of Islam, specifically the film on the history of the Prophet Yusuf [Joseph] and the film The Message. Aminiya reporters went to the Kofar Wambai market to see the shops that had been closed, and one of the film marketers, Musa Abdullahi Sanka who started selling film cassettes in 1976, said that the story was true. The Censors board had come and closed shops selling films on the history of the Prophet Yusuf and the history of Islam, The Message. When Aminya asked Abdullahi Sanka what reason the Censors Board had given for closing the shops, he said that the censors said that they should stop selling the film because apparently there were some Islamic scholars who had issued a fatwa on selling films on the history of the prophets, saying such films were not appropriate. The marketer responded saying that the businessmen wanted the well-respected Islamic scholars in Kano to come together and say whether the films were appropriate or not. If they said they were not appropriate, then how could they correct them? If they gave very strong reasons for banning the films, then the marketers would stop selling them. The marketer told Aminiya that four shops in Kofar Wambai had been closed: that of Alhaji Salisu, that of Ahmadu Hussaini, that of Anas, and another Igbo marketer whose name he did not give. He said that the film sellers got the films from Misira, others from Lagos, others were brought from Arab countries. He said that he had heard that the film on the Prophet Yusuf (Joseph) was made by Shi’a in Iran, and that is why the Censorship Board had cooperated with the fatwa of an Izala scholar against the film. When he was asked if he had seen the film and if it seemed to be appropriate, he said that he hadn’t seen the entire film but that he remembered how when he had been fifteen years old, the late Islamic Scholar Sheikh Nasiru Kabara had told the history of the Prophet Yusuf, and what he had seen of the film followed exactly what the scholar had told them. Another marketer Alhaji Nasiru Ibrahim K’ok’i, better known as Palasd’inawa, also expressed his unhappiness at the actions of the Censor’s Board. He said that they had been watching films on the lives of the prophets since they had been children. On Muslim holidays, the Kano state television station used to play them. The director of the Kano State Censors Board, Malam Abubakar Rabo Abdulkarim explained the reason for the ban. He said that it is in accordance with the culture and the findings of Islamic scholars who said that such films were not fitting as they were not respectful to the prophets. The gist of Malam Rabo’s statement was that the Kano State Censors Board was created keeping in mind Islam and the judgments of Islamic scholars who guide the community. The board had heard from the association of Islamic scholars and other religious organizations that people were trying to make money on offensive films made about the lives of the messengers of God. He also noted that they had called a meeting through a Dai Daita Sahu (Societal Reorientation Directorate) where one of the Islamic scholars had shown the danger of these types of films that were insulting to the Messengers of God and culture. Malam Rabo said that this is the reason the Censor’s board said that the selling of these types of films must stop because it was not fitting to show another man in the film claiming to be the Messenger of God. He further said that the Board would continue to hunt down those who brokered and spread films in Kano state, especially, he emphasized, those who were selling films on the sides of the roads because this is illegal.